Known for her "engaging sensitivity and a gorgeously full tone," [THE STRAD], Canadian violinist Erika Raum continues developing a following here in her native country and internationally. Playing professionally since the age of twelve, Ms. Raum quickly rose through the ranks by taking first place at the 1992 Joseph Szigeti International Violin Competition in Budapest as well as the award for best interpretation of a Mozart concerto. She has returned on many occasions to perform in Hungary, Portugal, Austria, Germany, England, Italy and France. She has appeared as guest artist with such orchestras as the Budapest Radio Orchestra, the Szombathely Symphony Orchestra, the Austro-Hungarian Orchestra, and the Franz Liszt Chamber Orchestra. A distinguished musician abroad, Erika also performs frequently throughout her homeland with orchestral appearances in cities such as Toronto, Calgary, Vancouver, Ottawa, Victoria, Halifax, and Edmonton. 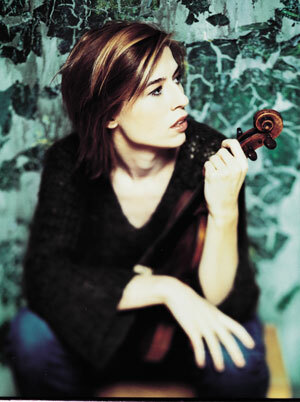 Both a recitalist and chamber musician, some of her recent highlights international appearances include the Festival Pablo Casals in Prades France, Beethoven Festival in Warsaw, the BargeMusic Festival in New York and past invitation include the Budapest Spring Festival, Szombathely Festival in Hungary, Carnegie Hall as well as the Caramoor and Prussia Cove festivals. During the summer of 2004 Erika participated at the Seattle Chamber Music Festival, Caramoor Festival, Alpenglow Chamber Festival and the Orford Festival. As a recording artist, Erika joined internationally renowned pianist Anton Kuerti in releasing the world premiere recording of Carl Czerny's piano and violin works. Recorded on this country's most active label, Musica Viva of CBC Records, this premiere recording highlights the masterfully composed, powerfully expressive works by the precocious composer during his teen years. Along with this recording, Ms. Raum's performances are often heard on an array of CBC networks across Canada. In 1993, composer Elizabeth Raum, Erika's mother, wrote her a violin concerto entitled Faces of Woman. The work was commissioned by the Regina Symphony Orchestra and broadcast nationally by the Canadian Broadcasting Corporation. Erika's sister, Jessica Raum, produced and directed the award winning documentary Like Mother, Like Daughter which recorded the event. Erika is a graduate of the University of Toronto where she studied with the late Professor Lorand Fenyves and was awarded the prestigious Eaton Scholarship upon her graduation. She is also a recipient of The Canada Council for the Arts - Career Development Grant. 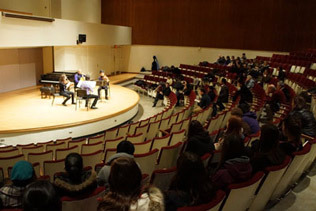 Ms. Raum is currently on the faculty of the Faculty of Music, University of Toronto and the Glenn Gould School at The Royal Conservatory of Music, Toronto. During the summer season, she serves on the faculty of The Banff Centre for the Arts.